8-channel microphone mixer offers compatibility with any low-impedance, balanced microphone, including wireless microphone systems. 8-channel microphone mixer offers compatibility with any low-impedance, balanced microphone, including wireless microphone systems. Includes adjustable EQ, phantom power LED, manual mixing, and peak-responding output limiter. 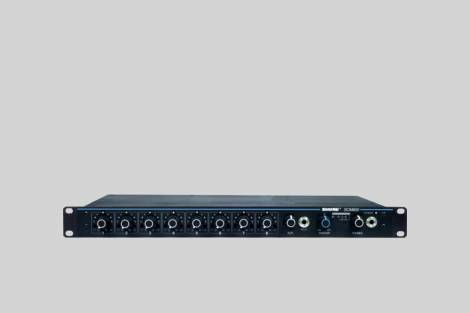 Each SCM800 accepts up to eight microphone- or line–level inputs and one aux-level input (two input jacks feed the same channel). Up to four SCM800 mixers can be linked to provide up to 32 input channels. Each input channel has a two-band equalizer, switchable microphone- or line-level operation, switchable 48 V phantom power, and a ¼-inch send/receive insert jack. The SCM800 is supplied with rack-mounting hardware, link cable and removable block terminal connectors. An accessory rack panel adapter (Model RKC800, available separately) converts the removable block input and output connectors to XLR connectors, and the Aux connectors to phono jacks.